Keeping things hidden in your home can be done in many ways. However, a few unique ideas can give you the opportunity to complete a fun DIY project. One idea that you may find interesting is to make a hidden compartment in one of the doors in your home. This can be done using almost any type of door used in an interior area of your home. The doors used in the interior of a home like a bedroom are a hollow core door. This means the interior of the door is hollow. 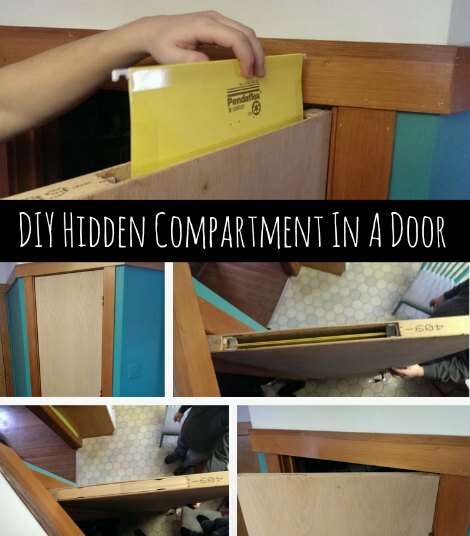 You can use this hollow area to make a hidden compartment to keep a few papers and other items hidden from burglars. A hidden compartment in a regular door will provide you a way to keep important items protected. If you do not want to work on any of the doors in your home, then you can easily find a hollow core door at any home improvement store. The only thing you need to do to complete this project is to find the proper tools and materials. This includes a saw to cut the opening for the hidden compartment, a frame or simple bracket, and some wood glue. The opening for the hidden compartment in a hollow core door is at the top. This is the best place for the hidden space as most burglars will not take the time to look for something hidden in a door. The use of a hidden space is a great option to keep extra money or other important papers.